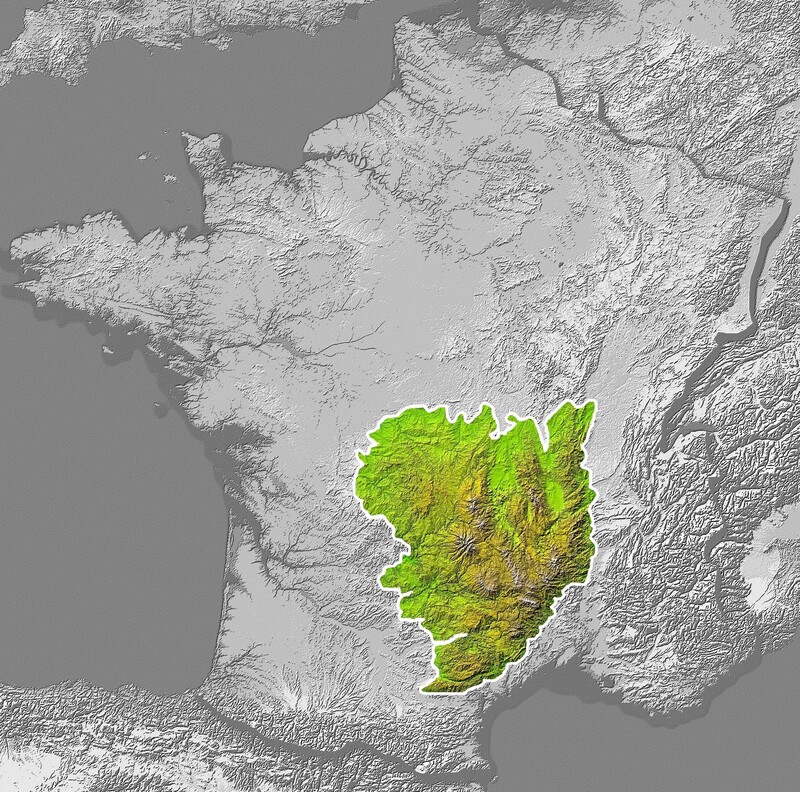 The Massif Central is actually located in the south of France; but fairly well centered on the east-west axis—just take a look at the cool map. Its boundaries sound familiar to wine lovers: it fills the area between the Loire River Basin to its north, the Mediterranean coastal plains of Languedoc to its south, the lowlands of Aquitaine to the west, and the Rhône-Saône River valley to the east. Most of the area within the Massif Central consists of rugged mountains, fertile valleys, and forests—about 35% of the area is forests. The rest of the land is open countryside and farmland, much of which supports three brands of cattle (Limousins, Aubracs, and Salers) as well as Lacaune Sheep—famous for producing the milk that will become Roquefort Cheese. A few small towns dot the middle of the area, and three cities—Saint Etienne, Clermont Ferrand, and Limoges—are located near the edges. The outline of the area, which does not conform to any political or regional boundaries, is considered to be demarcated by the contour line of 1,000 feet (300 m) above sea level. Most of the land sits at an altitude of about 1,640 feet (500 m). The Massif Central stretches over 200 miles from north to south, and about 175 miles (at its widest point) from east to west. This is a large area—all told; it covers about 15% of France. It is also the third highest mountain range in France, thanks to the 6,190-foot (1,885-m) summit of Puy de Sancy. Many famous wine-related rivers have their source in the Massif Central. These include the Lot and the Tarn—both tributaries of the Garonne; as well as the Dordogne and the Loire. Some vineyards are tucked around into the valleys and the outskirts of the uplift. One of these, the Côtes de Millau AOC, is the easternmost of the South West France AOCs. 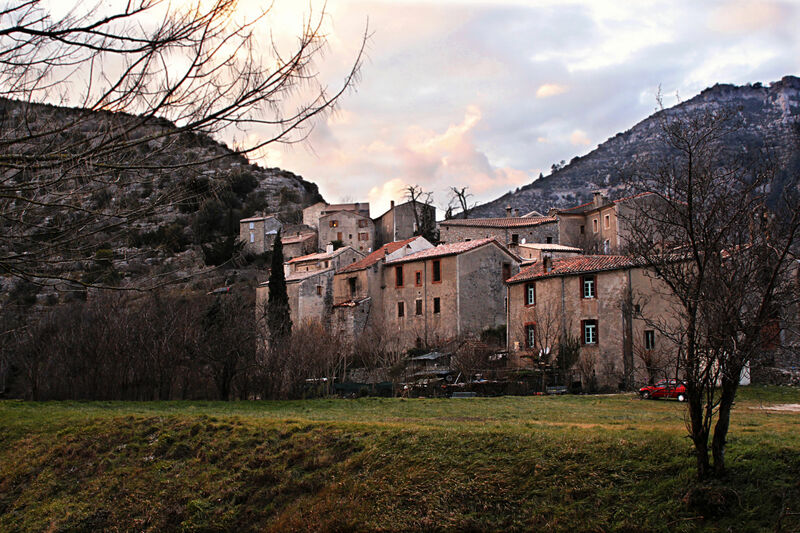 It is located in the south of the Massif Central in and around an area known as Causse du Larzac—a limestone karst plateau situated between the towns of Millau and Lodève. Karst is a landscape formed from the dissolution of soluble rocks, such as limestone, and the deep valleys and gorges here were created over the millennia as the Tarn River cut a series of paths through the limestone. Most of the Côtes de Millau vineyards are planted on steep, terraced slopes in the deep valleys of the Tarn. The Côtes de Millau AOC produces red wines (dry), white wines (dry and off-dry), and rosé (dry and off-dry). The reds are blends, based on a minimum of 30% Syrah and 30% Gamay, 10% to 30% Cabernet Sauvignon and an allowed splash (max 20% each) of Fer and Duras. Rosés are based on a minimum of 50% Gamay; Cabernet Sauvignon, Duras, Fer, and Syrah are also allowed. White wines are made with a minimum of 50% Chenin Blanc and a minimum of 10% Mauzac. If you’d like to visit the wineries of the Côtes de Millau, you’ll need to transverse the Tran River Gorge. 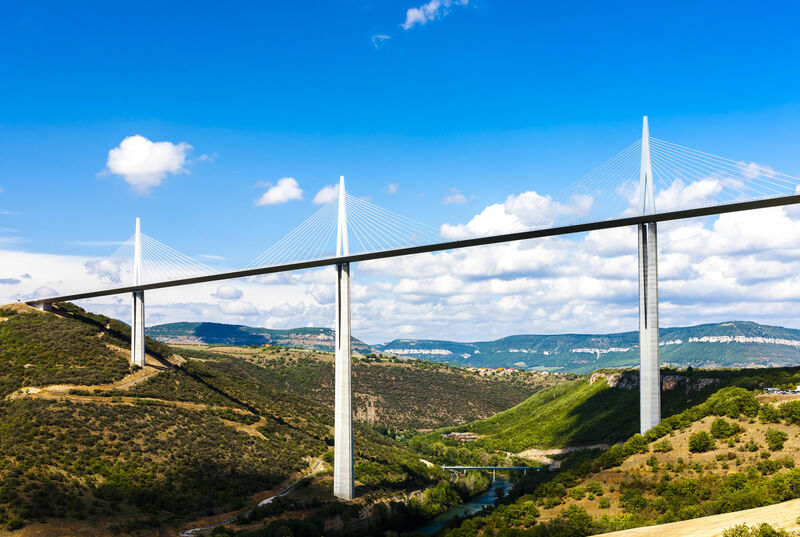 Have no fear, you can drive across via the A75 highway on the cable-stayed Millau Viaduct bridge, and when you do, you’ll be on the tallest bridge in the world. The height of the tallest mast is 1,125 feet (343 m) and the bridge deck is 890 feet (270 m) high. If you are bothered by heights, it might be best not to look down.